Just seen on John's Auction, an alternative 1st take of Thelma 106. Listened to auction sound clip, Dug my copy out (first time for many years!) and I cant tell the difference between mine and John's clip! I notice John's clip is quite a long clip (1:40) so I presume the difference comes in quite a way thru disc. dunno if it's of any relevence but I notice in run out groove the ztsc number 97700 has been scratched out and replaced with 97699. Tried to compare with the Emanuel Laskey file on the excelent "Soul Club" but think that may be the Billy Kennedy cut. First thing I gotta do, is check that the right "soundclip" is on the site!! Which I will do ASAP. here's a sort explanation for what to look for. Can anyone else come up with different takes on Northern Soul vinyl. Both these are on PROMO's and are certainly different takes with different matrix markings to the regular copies you see. Others I know of but have yet to document. Any others you can add will be most welcome. Meanwhile I'll double check the correct soundclip is up with the Promo cpoy on auction. I sold the stock copy different take to a Thelma completist. That copy was certainly different and yuo could tell from the start. I will endeavour to check all this out. Priscilla Page I'm pretending (Topper) has two diffrent mix's but haven't got the records on hand to check matrix. Derek Martin ''If you go'' (Sue) demo & issue different. I'll see if I can find some more. The mix on John's site is definitely a different mix to my version. Guess what? There are THREE different mixes. on the site has a different drum intro and many other differences through the record BUT you may have that copy in your collection. 2. matrix reads ARP ZTSC 97699 and Nashville Matrix 59 this is the one that you usually find. 3. matrix reads AG ZTSC 97700 Bell Sound (stamp) G this mix is just totally different and may have been the one Paul Rudz was refering to. I'll try and add this to ROTR next week so you can all have a listen. I do want to document all the diff. mixes on all Northren Soul collectables in Price Guiide ed. 4. So help on this would be appreciated. there's (at least) two versions of the brilliant 'my darling baby' by edward hamilton on mary jane. I seem to remember Trickster playing me an alternative version of the Professionals T.W.I.L.Y. IMO no better than the known version, which I loathe. I had the alternative mix of this on a stock copy. I swapped it with a very well known Lincs dj and collector (for Harry Starr I think). Until I played it I'd never heard it but apparently it did come out on a Kent cd. Totally different take though, much sparser. There are two takes of the Ruby 45 on Gold Token, Feminine Ingenuity has a much better production and strings more upfront on the rarer version. Slow & fast versions of Someone tell her - Imperial C's. 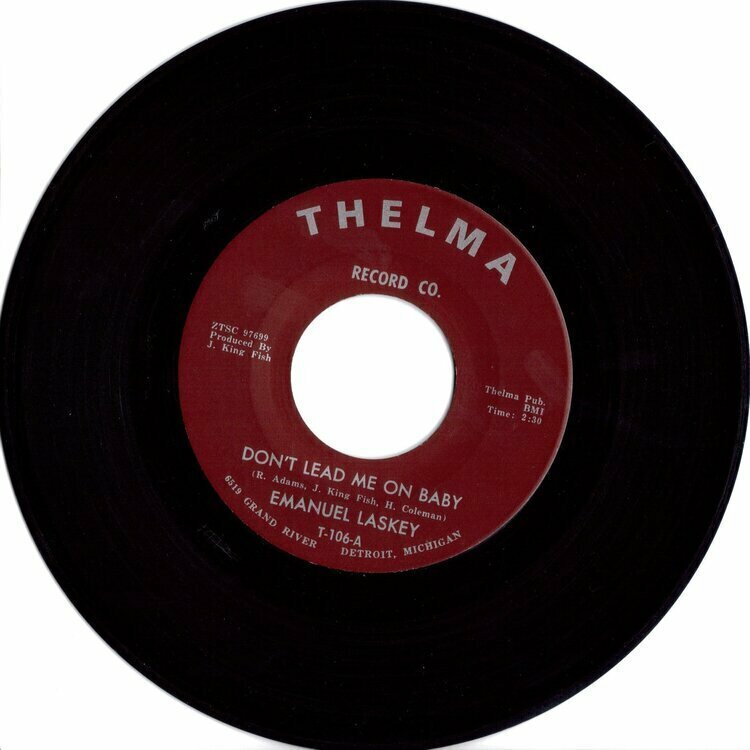 This a link to Emanel Laskey - Don't lead me on as it appears on the Goldmine CD TheThelma Story. Sounds just like the Soul Club version to me which folk say is Bill Kennedy. Can anyone clarify this? I think it means records which were released mate. is that the one with girl backing? Kenny Smith,lord whats happening to our people,how many differant intro`s,labels etc,same with Sequins,he`s a flirt,some start with a "2-3-4"if you know what i mean? According to Kenny Smith himself, it was issued twice; the first release is actually the Goldspot pressing, it was then released on GAR (white demos and issues). I was told that Simon Sousan brought some of the Goldspot copies into the UK and so people assumed it was a boot or reissue. The Goldspot copies do have a newer "70's" press look about them, but then again the GAR copies look older because it's that crap 'Chicago' vinyl, and so I think this may have exacebated the rumours about the Goldspot pressings. Only just read this. Cheers for that John. It turns out that the one I've got in my box. Have had the different copies in my hands, so I know they exist. Also, got passed on a sound file of a diffrent mix of Linda & Prentenders - Believe Me, just recently, apparently a diffrent pressing! Thanx John, for the info, but now am really confused! Am I right in thinking you're gonna put the rare version on ROTR? Anyone got a file of the "1st mix"
Carol Jones on Mutt (has two releases and both sides are different). Which one have I got? On the Laskey...difference in value of all these versions?